From the viewpoint of the Twenty-first Century, I find it very difficult to understand why there was much enthusiasm to undertake several of this nation’s Nineteenth-Century War,s including the second war against Britain in 1812, the war against Mexico in 1848 and the brief war against Spain in the summer of 1898. They are all commemorated in Twenty-first Century Detroit in one manner or another. Spain maintained colonial control of Cuba and Puerto Rico throughout the Nineteenth Century. Some in the United States thought that it was inappropriate for a European power to maintain a colony in Cuba so close to this country. By the 1870s, an increasingly powerful independence movement emerged in Cuba, a movement that some American supported, although the government in Washington maintained neutrality. The Spanish were not especially capable colonial administrators and kept no more than a modest array of military forces in Cuba. The independence movement in Cuba unilaterally declared an end to colonialism on January 1, 1898. Violence between the Spanish administration and the Cuban independence movement was foreseeable, so President William McKinley dispatched the United States warship Maine from its port in Key West to nearby Havana to protect this nation’s interests, and in case of revolutionary violence, extricate United States citizens from the Spanish colony. On February 15, 1898, the USS Maine blew up in Havana harbor with the loss of 266 sailors. Many blamed the Spanish for an attack upon this ship that was docked in their harbor. The Navy’s investigation, completed in March, 1898, was ambiguous about the exact cause of the explosion, but did not firmly rule out Spanish sabotage. In the United States, many began to call for a war against Spain using the slogan, “Remember the Maine.” In particular, two competing media giants in New York, Joseph Pulitzer and William Randolph Hearst, emphasized Spanish atrocities against Cuban revolutionaries, blamed Spain for the sinking of the Maine in Havana and emphasized the need for an immediate war. Quite a few political leaders joined that movement. President William McKinley attempted to maintain diplomatic negotiations with Spain, but realized that there was a popular demand for war. Presumably, Washington officials knew that Spain had few and not particularly well-trained troops stationed in Cuba. It appeared to be an “easy” war for the United States to win. The situation deteriorated. Diplomacy made no progress so Spain declared war on the United States on April 23, 1898. The United States Congress declared war on Spain on April 25, 1898 but retroactive to April 21. The war in Cuba was quick. The United States invasion began in June and was thoroughly covered in the press. By mid-July, Spanish forces in Cuba were defeated. The United States also attacked the Spanish military stationed in Puerto Rico but used fewer troops. Indeed, the United States Army, at this time, was not well prepared for invasions of Cuba and Puerto Rico. In the latter island, the fighting was more prolonged and by the time of the truce, the United States had not completely defeated the Spanish. The Spanish lost this Philippine colony even before they lost Cuba. Anticipating the possible onset of war, U.S. Commodore George Dewey lead naval forces to Manila before the start of the war. The German navy also sailed there, perhaps hoping to defeat the Spanish and take over valuable naval facilities there. Shortly after the United States declared war, Commodore Dewey attacked and defeated the Spanish fleet in the Philippines. By May 1, 1898; the Spanish lost the Philippines since they could not enter their major port there. Having lost Cuba and the Philippines, the Spanish sued for peace. August 12, 1898 was established as the armistice date. On December 10, 1898, the two nations signed a treaty in Paris. The independence of Cuba was guaranteed and the United States obtained Puerto Rico, Guam and the Philippines as colonies. Puerto Rico and Guam remain under United States control, but the Philippines were granted their independence in 1946. After completing his second term as mayor of Detroit in 1933, Frank Murphy was appointed to serve as governor of the Philippines and did so until 1935. About 2,500 American service personnel died in combat or of disease in the campaigns against the Spanish military in Cuba, Puerto Rico and the Philippines. This includes the 266 deaths on the battleship Maine. Many observers assumed that battle casualties would end with the August 12, 1898 truce. However, when United States forces attempted to occupy the Philippine islands, they met very stiff resistance from Philippines. About 11,000 United States troops spent five years in the Philippines fighting resistance fighters. This nation lost another 4,200 service men in those battles. The war memorial that you see is extremely attractive, at least in part because it was refurbished in 1999. The pristine white granite conveys a serious sense, recalling the substantial loss of life in the Spanish-American War. To the left you see a classic sculpture of an infantry man in the traditional contrapposto stance shown in bronze. The figure of the sailor to the right reminds us that the Spanish-American War was largely a naval endeavor. I have never seen a picture of this monument showing these figures in their original gleaming bronze color, only in the current patina. Allen Newman, who lived from 1875 to 1940, was a reasonably well-known and popular sculptor of the early Twentieth Century. 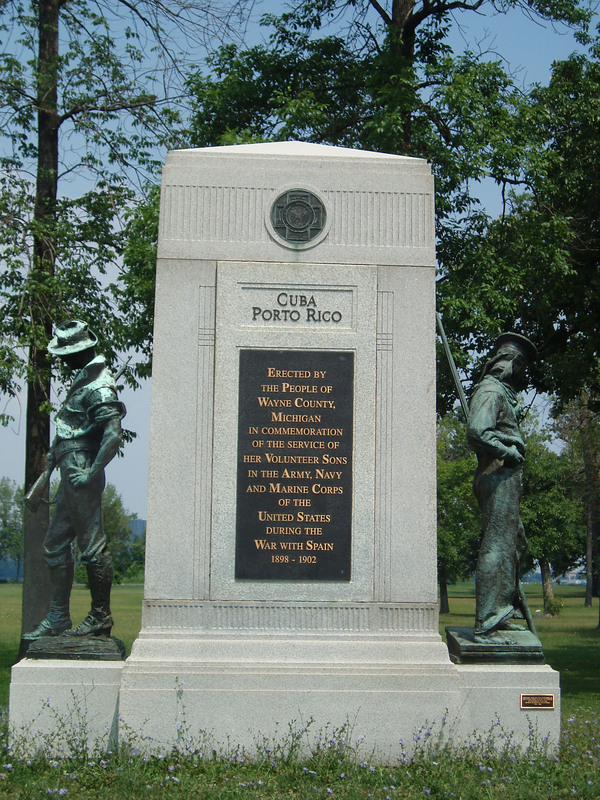 He specialized in outdoor sculptures commemorating the Spanish-American War. Indeed, he designed and then obtained a copyright for the figure of the soldier shown above. He went on to use this figure or a slight variant of the figures in a dozen or more sculptures. I believe there is a memorial commemorating the Spanish-American War in Central Park in New York with a similar soldier. I do not know of other memorials to the Spanish-American War dead in the Detroit area, although there is one in Three Oaks, Michigan mentioned on this website: Michigan Central Depot, Three Oaks. State of Michigan Registry of Historic Sites: Belle Isle is a registerd historic district. National Register of Historic Places: Belle Isle is a registerd historic district.